AP polycet 2019 Certificates verification date, List of documents for Certificates verification of ap polycet 2019: AP #POLYCET is a Polytechnic common entrance test conducted by State Board of Technical Education and Training, Hyderabad for admission into Diploma level programmes conducted in Government,aided, Private unaided polytechnics and polytechnics run in existing Private unaided Engineering Colleges. 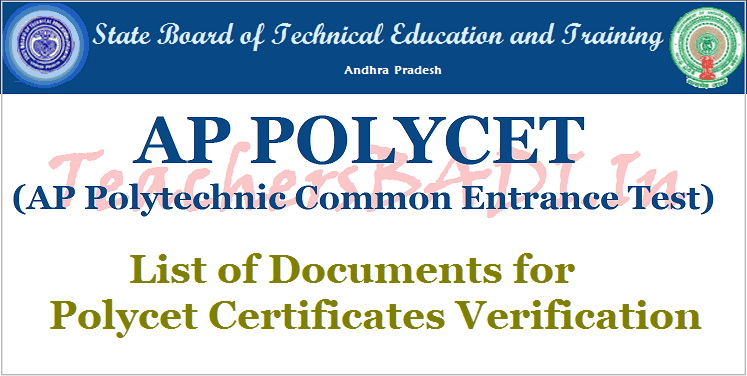 Every candidate desirous of seeking admission into Engineering/Non - Engineering Diploma courses can apply through online for AP POLYCET-2019. No separate application form for admission is prescribed. The filled in application for POLYCET-2019 itself is an application for admission. Polytechnics Admission will be made based on web options exercised by candidate. Details of the web based allotment programme would be indicated on our website https://appolycet.nic.in/ and also notified in the leading newspapers soon after the declaration of results of POLYCET 2019. The detailed programme with the ranks of the candidates called on each day for counseling will be published in daily Newspapers in English / Telugu / Urdu having wide publicity to enable the candidates to attend the Admission Camp on the specified date, time and place for each region. No separate call letters will be sent to the candidates for attending the counseling. The admission programme will also be displayed at the admission camp and in all Polytechnic. Admission notification issued in the press is to be treated as call letter. 4. Income Certificate issued on or after 01.01.2019 or white ration Card for claiming tuition fee reimbursement. Certificates verification start from: ..-05-2019.